Fifty years ago, a young Sri Lankan schoolgirl came across a small advertisement calling for actresses. Swarna Mallawarachchi didn’t own more than three or four photographs of herself. She was still in school and the thought of becoming an actress had never crossed her mind – her aspirations so far were to go to university and be either a teacher, lecturer or perhaps an air hostess. She was an avid reader and she couldn’t help but feel excited when she saw that the call for actresses was by one of her favourite writers. She applied on an impulse with the few stamp sized photographs she possessed, purely to catch a glimpse of novelist, filmmaker and cultural critic, Siri Gunasinghe, whose work she admired. She was stunned when she was asked to come for an interview. She didn’t tell her family at home and instead, confided in a friend, borrowing a saree from her friend’s mother. Accompanied by her friend’s mother and wrapped in her saree, Swarna boarded the bus to Ward Place. She didn’t know how to apply makeup and her nervousness was exacerbated by a fever. When she arrived, she surveyed the room with dismay. The waiting room was filled with beautiful women carefully attired and with professional hairstyles and makeup. In comparison, she felt gauche and out of place. Years later, Swarna was watching an interview on local television where the late D.B. Nihalsinghe regaled her first audition from the panel’s perspective. The veteran cinematographer noted in the interview that when he looked at her through the camera, he was immediately struck by her nose and sharp profile. He quipped that Swarna’s nose could launch a thousand ships. It is Swarna Mallawarachchi’s first appearance in a film after a 20-year gap. At the premiere of the movie, she strikes a quietly imposing figure with her close-cropped hair and simple black sari.It’s been fifty years since her fluke audition as an impetuous school girl. She has garnered a name for her acting (the many awards she has accumulated occupy pride of place in the dining area in her apartment) and after the movie, there’s a small flurry of people who approach her with eager questions or a request for a picture. It seems poetically apt that Swarna’s last film (Chanda Kinnaree) before a 20-year gap from acting and her return to the screen were directed by Asoka Handagama. Handagama describes her as “Every filmmakers dream at that time, at her peak” and was fascinated by her acting even before he became a film director. When he wrote the script for his first movie, he sent it to her to get her feedback and then later, found out that she liked the main female lead (a debt-ridden, liquor soaked clerk’s long suffering wife), set in the script. Emboldened by this, he decided to approach her for the part and was delighted when she accepted. Handagama points out that because of the two decade gap since her last film, audiences still view Swarna in her younger avatar and remembering her crystallized on film at the peak of her youth. He notes that with actresses like Malini Fonseka, local audiences have been privy to her growth and this transformation is visible through her filmography. “You don’t catch that flow in Swarna,” he muses. When audiences sit down to watch the movie, it takes time to reconcile Swarna’s appearance to her image crystalized in film two decades ago. For Handagama, Swarna’s re-entry into cinema and her changed appearance were crucial for elements of the film and helped craft her character in the movie. Handagama’s latest movie ‘Age Asa Aga’ (translated as ‘Let her cry’ in English collateral) takes on themes of relationships, societal norms and religion. Swarna plays the part of a professor’s wife, dealing with (or in denial of) her husband’s extra-marital affair with a student and propels the action of the movie. Swarna, Asoka emphatically states, was his first and only choice for the part. 2016 marks Swarna Mallawarachchi’s 50th year in Sri Lankan cinema. Her approach to acting has balanced constant learning, a casual laissez faire stance and choosing complex female characters to portray onscreen. Returning was a matter of picking up from where she had left off. “She’s very open minded and she doesn’t bring anything to the set other than the instructions from director,” notes Asoka Handagama. On set, Swarna would come and watch scenes, even if she wasn’t in them, absorbing her co-stars’ mannerisms and actions, mentally taking notes on how her character should respond. “When you look at good actors and good acting on the set, you can learn a lot,” she says simply. For Swarna, the greatest acting lessons came from observing other actors and watching films. During the early stages of her career, she moved to England, spending five years there and then later, two years in Australia. She had five pounds in her bag, a friend in London and a lot of faith and clambered through a window of opportunity when it presented itself, moving countries with little hesitation. She couldn’t afford to go to acting school and had no formal training in acting but instead did the next best thing – watched all the good movies she could lay her hands on during her time abroad (this was the best part of living in London, she explains). The 1995 Calcutta International Film Festival featured a retrospective of Swarna’s films and Dr. Lester James Pieris writes a paean in its souvenir brochure speaking of the same photogenic quality that D.B. Nihalsinghe spoke of, lamenting that they had never worked together. 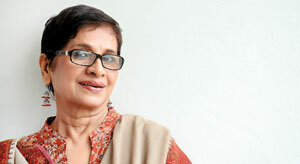 “The pity is that in our Sinhala films there are so few female characters who are strong, rather than weak and passive. In formula films, half their characterisation is confined to smashing up herbaceous borders, polluting the scenery, Swarna has no such amorous dalliance with trees and flowers and public parks but subtly, stroke by stroke etching on celluloid some of the most powerful ‘women’ characters in Sinhala cinema..” writes the veteran director. During our conversation at her apartment in Colombo 7, Swarna pauses to bring out the faded souvenir, smiling with evident pleasure as she reads out aloud the director’s words. She ruefully confesses that she hasn’t watched all the movies she has acted in – when movies like Samanala Sihiniya were released, her daughter was too small to leave behind and go watch them – nor does she have copies of all of them. She’s reticent about her early years (she’d like to write an autobiography someday and would like to retain a modicum of mystique for that) but is easy to talk to and contains the same onscreen vivacity, in real life. What was the toughest part about coming back to the screen? “There was no tough part,” she laughs. “It was very natural from the beginning”. The roles Swarna has portrayed have been complex and layered women. In a famous scene in Vasantha Obeysekara’s Dadayama, her character, a village baker’s daughter, shatters the manacles of tradition – perhaps in its literal sense. In the film, her character smashes the windshield of the arrogant lover who ruined her, with the fierceness of a woman who has reached breaking point. Currently in theatres till June 10, 2016, Swarna’s character in Age Asa Aga deals with her husband’s affair in an unusual way. The actress avers that thanks to local TV channels playing her movies – perhaps the only link between the present generation and us, she muses – it never felt as though she was away from the screen for two decades. There were a few sporadic film offers, but nothing which lured her back. A script revolving around the life of Richard de Zoysa’s mother was promising, but the project, now in its 18th year in the pipeline, always approached the runway with enthusiasm but never took flight. It seems flippant to call her time away from the screen as a ‘hiatus’. Over the past two decades, her lull from the screen was filled with work as a media consultant at an NGO and serving on the jury panels of film festivals around South Asia while devoting herself to her daughter’s education. Swarna also wrestled with illness, battling a brain tumour and breast cancer. Known for her Indian-inspired sartorial style, Swarna now extends her clothing picks to run an online store called Cholie Boutique (http://www.cholieboutique.com/), the digital reincarnation of a physical clothing store she opened in 1993 and closed in 2002. There’s an emphatic ‘No Regrets’ policy which guides her life (“If I am to regret in life, I will never be the woman I am today”) and plans are also afoot to establish a Swarna Mallawarachchi Foundation to empower girls.